What is AABB-Accredited DNA Testing & Why Does It Matter? Due to the prevalence of mail-order DNA test kits, more people are trying to learn about their genetic background. However, DIY DNA testing isn’t the most reliable despite the promises made by manufacturers. Let Test Smartly Labs explain what it means to be an AABB-accredited lab and why this accreditation is so important when it comes to DNA testing. Why Go With an AABB Accredited Lab for DNA Testing? The American Association of Blood Banks (AABB) is an accreditation agency that oversees national labs. They make rules about DNA testing quality standards that labs must follow in order to receive accreditation. The AABB is known as the leading DNA testing accreditation agency worldwide. What Does AABB-Accredited Mean in Terms of DNA Testing? What does it mean when a lab is AABB-accredited for DNA testing? The lab performs DNA testing that meets or exceeds industry standards that have been determined by the worldwide leader in DNA testing accreditation. Your DNA test will be court admissible, so you can use it in custody cases, inheritance disputes, for immigration purposes, and more. This is because the collection specialists at the accredited lab are following the proper chain of custody protocols, ensuring that DNA specimens are properly gathered and moved. 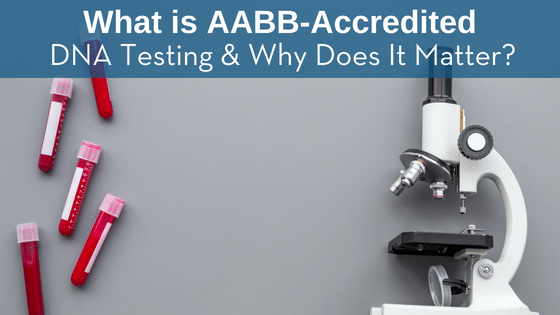 Since AABB accreditation is a yearly process, you know that any accredited testing lab is up to date on their training and education, undergoes quality checks for its DNA testing collectors and specialists, and has modern facilities and equipment. DNA testing is becoming more common, but you should beware of at-home DNA testing companies. DNA testing is only as accurate as the lab doing the test. If you don’t work with an AABB-accredited lab, you can’t know that the DNA test results you receive are accurate. Test Smartly Labs makes sure our staff are all trained in accordance with AABB-established collection guidelines for DNA testing. Plus, we only work with AABB-certified laboratories for all DNA analysis. Test Smartly Labs provides confidential and accurate DNA tests. To learn more about our DNA Testing Services, contact Test Smartly Labs today at (816) 800-9699. We have five lab locations in the greater Kansas City area! LIKE us on Facebook to keep up with our specials and announcements! Next ArticleWhat Form of Paternity Testing is Best for Me? Previous ArticleHow Can a Genealogy Hobby Help Police Catch a Killer?